FILE - U.S. President Donald Trump meets French President Emmanuel Macron in New York, Sept. 18, 2017. U.S. President Donald Trump will host French President Emmanuel Macron for a state visit this week as the Iran nuclear agreement hangs in the balance, and the expiration of EU’s exemptions from steel and aluminum tariffs nears. FILE - French President Emmanuel Macron, left, shakes hands with U.S. President Donald Trump, next to U.S. first lady Melania Trump during the traditional Bastille Day military parade on the Champs-Elysees in Paris, July 14, 2017. IIn this photo released by an official website of the office of the Iranian Presidency, President Hassan Rouhani listens to explanations on new nuclear achievements at a ceremony to mark "National Nuclear Day," in Tehran, Iran, April 9, 2018. 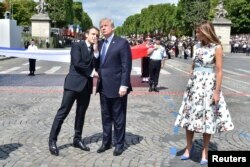 French President Emmanuel Macron, right, and U.S. President Donald Trump watch the traditional Bastille Day military parade, including military jet flyovers, on the Champs Elysees, in Paris, July 14, 2017.
Who is America’s Best European Ally?